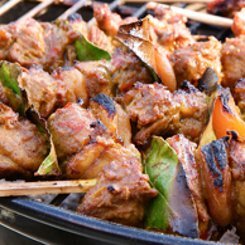 Summer is here and a braai is just not quite the same without lamb sosaties. Here is a really fantastic sosatie recipe that you will want to print and keep for your weekend braais. This sosatie recipe uses dried apricots on the skewers but you don’t have to use them, they are just as good without. For me sosaties should not be hot so I use mild curry powder. (makes 8 sosaties) Feel free to double it up. Place them in a large dish and prepare the marinade. In a pan on a medium heat, add the oil and the butter, then add the grated onion, garlic and curry powder. Allow to cook for about 3 minutes or so, stirring every now and then. Now add the turmeric, the lemon juice and the stock, bring it all to the boil, turn down the heat, add the sugar and bay leaves and simmer for about another 3 minutes stirring constantly. Remove from the heat and allow to cool. Pour the whole lot over the sosaties, shake them about a bit to ensure that each sosatie is covered with the marinade, then cover with cling film and allow to marinate in the fridge over night. In the morning, or before you go to bed, give them another shake about to cover the sosaties again. Braai them over hot coals and serve with a squeeze of lemon juice. Try the Bobotie recipe and the Pork rib marinade if you like this type of Traditional SA food. It have taken me quite a few years to find out what is the difference between a sosatie and a kebab. They both look the same thing. At a stage I believed that it is the same thing but two different names. Studying recipes on the internet I have finally come to the conclusion that a sosatie have curry as one ingredient and a Kebab have no curry in the recipe. I am looking for a recipe that appeared in a magazine during 1981/82/83 for a sosatie sauce. One of the ingredients was “Royco Beef & Tomatoe Soup Powder”. Can you please help me? I just want to thank you for all the updates and meal suggestions especialy before a weekend. It is much appreciated.